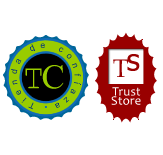 256-bit SSL certificates that guarantee secure communication of your server via https://. - CVC2/CVV2: 3 digits behind your card, the system will tell you where to find them graphically. - Special PIN for Internet commerce. This will be the key you assigned to your card when activated for secure commerce on the Internet. If you still do not have it turned on can do so by calling your bank or on request from its website. What gives me safe payment service? Data is transmitted in an encrypted SSL. To pay by Visa and MasterCard transactions will only be accepted CES (Secure Electronic Commerce). After verifying that the card is attached to the CES system, the system will connect with the bank that issued for the buyer to authorize the purchase. When the bank confirms authentication, be charged by the card. Besides credit cards, are there other forms of payment? When making the transfer must be provided as a reference the order number and full name of the client, as indicated when ordering. This will only be sent once payment has been received. ¿I can get a bill on behalf of my company? If, in order observations indicate the fiscal data of the company to develop the invoice.